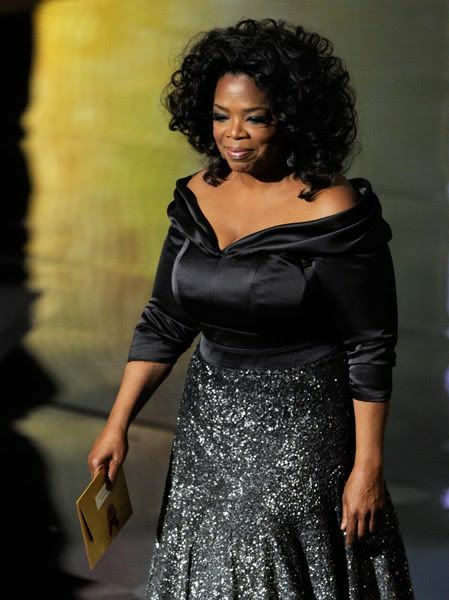 A few minutes ago, Oprah finished the morning taping of her final Oscar aftershow in L.A. at the Kodak Theater. Now, YBF has learned that before the audience departed, Ms. Winfrey announced that the last "Oprah show" will air on May 25th, 2011 (which is also the last day of the May sweeps ratings period). Oprah fought through a cold to complete her annual post-Oscar show. And it even has a few surprises in tow. What the h*ll do I watch at 3:00 now? Gonna miss u Lady O.
Ladies check out www.KarensClosetNY.com for fierce blazers, hot tops, leggings, plus sizes and of course DRESSES! Today only receive 15% off EVERYTHING on the site!! There's one interview that haven't been done yet by anyone. It woud be great if she closed out her show with that interview(Jay-z & Beyonce) on them being great at what they do as entertainers, their life as husband & wife and future parents. Since they both are her good friends it would be a big send off for her. Wow she has been number one in daytimes ratings for 25 years, so that is the way one leaves. I will miss Mama O'. man, i havent always agreed with what Oprah has said..or done...but dang...for her to just leave daytime tv is crazy! thats like if All My Children goes off the air! she will be missed. although i have a daytime job and NEVER get to watch her anyway. I agree 100%. I have come to detest Oprah. She needs to have given a hands up to some black entrepreneurs and authors. She will dig up the oldest white has been and all but kiss their shrivelled toes. All that money and she still wants to be white. I was thru when she refused to have Ludicrous on her show with the rest of the cast of Crash because he was a rapper. I will truly miss this one-of-a-kind woman. Oprah is a brand. I'm happy for her, though, because she said that it was time, and she is ready for the next chapter in her life. She's happy about it. It's been a long journey, and I'm so proud of her. Lady O, thank you for 25 years of bringing blessings to those around you and your fans all over the world! Oprah's last show is May 25 - NOOOOOOOOOOOOOOO!!!!!!! Diddy is the devil - NO - YOU'RE THE DEVIL - YOU GO AWAY!!! I will not miss this WIND BAG! And OWN is not doing well. Oprah needs to just go away her time is over. I will definitely miss her. I will definitely miss her. She truly is an inspiration to young black girls born in any station of life to know that they can really have it all. I don't know why you had to tease us with this info by putting the date on the 2nd page. We knew this was her final season. Was it necessary to make it seem like there was a story here? One page would have done just fine. I'm not clear on why this is an exclusive or a surprise...isn't that the usual time that the season ends? I don't really remember seeing new episodes unless there are guests promoting a movie. Lots of the summer episodes are reruns.... Good luck to Ms. Winfrey in her future endeavors. I was never really a fan of her show, but she has been at the top of her game, gave lots of opportunities to others and opened doors for innumerable others. Hats off to her. I must say, Oprah had the best season to date this season. I've probably watched every episode! We're gonna Ms. you Ms. O! She's made her mark and literally done all that she can do. Kudos to her for knowing when to shut it down. Time to move on. She will be missed though. OOOO LAWD Jesus take me now!! !